In March of 2008 at the age 65, I was diagnosed with a very rare, very aggressive Stage IV lymphoma called Peripheral T-cell Lymphoma (PTCL), NOS. Because this type of lymphoma is so rare, doctors around the world don't have a standardized treatment. Approximately, 3000 Americans are diagnosed with PTCL annually and only 20% survive. After months of tests, hospital visits and consultations, I was accepted into a research protocol at the NIH's National Cancer Institute where I underwent 650 hours of experimental, dose adjusted chemotherapy. Because of this research participation, not only was I part of helping doctors move one step closer to a cure, but I have been CANCER-FREE since that treatment. In March 2014, I celebrated my six year cancer free anniversary but was also told that I am CURED of my cancer! Very, very few ever receive this news. All this good news because of clinical research! Family and friends supported the three of us (my wife, son and I) throughout the long months of treatment. However, the fight against cancer is still raging on and I'm asking for your help to make sure this valuable research continues - THIS IS WHY I WALK! The Zavadowski's are driven by the desire for our family's survival story to become a reality for others! 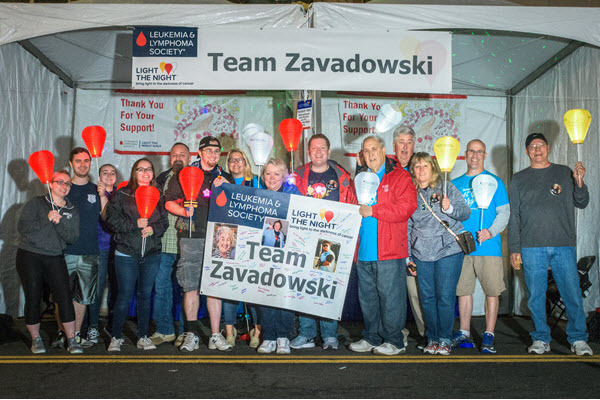 This year our family will again participate in the National Capital Area's "Light the Night" walk -- the Leukemia & Lymphoma Society's evening walk and fundraising event. For a few years, we were the #1 Family & Friends Team at our walk, and this year we're working to do it again -- and joining in with hundreds of thousands of others around the globe to raise funds for lifesaving research and patient services! For more than 60 years, The Leukemia & Lymphoma Society (LLS) has been solely focused on people with blood cancers. Presently, LLS has more than $250 million committed to research across the United States and in ten other countries. Every dollar is provided by concerned donors. . Please donate on this page by clicking "Donate Now" on the right-hand side, red box. ANY amount makes a difference, and you'll join hundreds of thousands of people supporting this all-important event! And if you're in the Washington, DC area on October 20, 2017, please consider joining our team and walking with us...it is a BLAST of an event! The event is held on the Washington Mall! • A donation of $30 provides patients and their loved ones with FREE booklets that contain up-to-date information on their disease and help them make informed decisions about their treatment options. • A donation of $50 makes possible a Family Support group with a trained facilitator whose comfort can be found and experiences can be shared among patients and family members. • A donation of $100 helps supply laboratory researchers with supplies and materials critical to carrying out their search for cures. • A donation of $1000 makes possible one-on-one conversations with health care specialists who provide patients with information about their disease, treatment options, and helps prepare them with questions for their health care team. Please make a donation to support my participation in the Light The Night Walk and help save lives. Be sure to check my Web site frequently to see my progress, and thanks for your support! "GOOD TO SEE THE ZAVADOWSKI FAMILY TOGETHER AND SUCCESSFULLY FIGHTING FOR A GREAT CAUSE. CONTINUED SUCCESS. " "Praise the Lord for your victory over cancer!" "Hopefully, we are closer to the cure!"